We have covered GPS devices and the various fitness metric websites in the past with a view towards cycling and as the TomTom includes a cycling mode it kinda makes sense to be reviewing it here. It’s now seven months since I got hold of my TomTom Multisport GPS watch and I have been waiting to do the review for a while, but just holding back until my first couple of Triathlons this year. With over 200 activities logged on the watch and almost a dozen software updates I’m now ready to let you know how I have been getting on. A lot of GPS watches out there are big and bulky, and certainly won’t fit under a smart shirt. 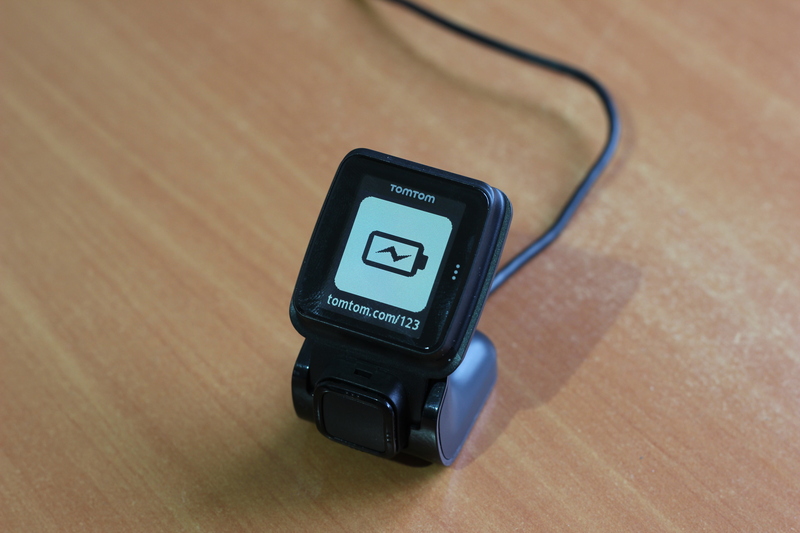 The TomTom is quite slim though, partially as the GPS antenna is located separately from the watch face. The face itself is very clean and shows the time and date on an uncluttered screen when in normal use. There’s a backlight too and TomTom added a stopwatch function after a couple of months via a software update. No countdown timer which is a bit of a shame but it doesn’t scream ‘sportswatch’ when worn every day. Battery life is good, really good. I have used it for a full week without charging and with 4 hours of logged activities and there was no problem. The HRM strap itself if fine and uses the ‘new’ Bluetooth Smart technology rather than ANT+ or Polar’s proprietary system. It’s comfy enough, waterproof (good enough to swim in) and washable. Haven’t had to change the battery yet either. There are some new watches out there with optical HRM sensors built into the watch but by having a separate sensor you can connect to other devices too. As well as using GPS to track your position and speed there is an option to pair the device with a separate speed and cadence sensor. 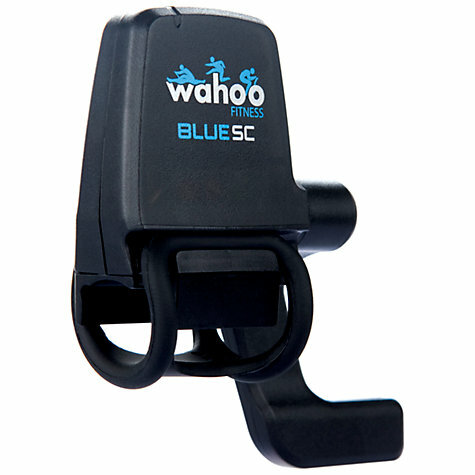 TomTom sell their own or you can use the excellent Wahoo Fitness Blue SC sensor. Why would you want to do this? Well, it adds cadence readings which is quite useful and it also gives you the opportunity to measure speed on an indoor turbo trainer where speed is measured via the back wheel. That’s the theory anyway but in practice it doesn’t work as well. I have now resorted to using the native Wahoo Fitness app which has been available for iOS for ages and now has a cool Android version which I used throughout the beta testing phase. It’s actually a much better way of looking at your stats than the TomTom, especially for turbo trainers but you will need a handlebar mount. 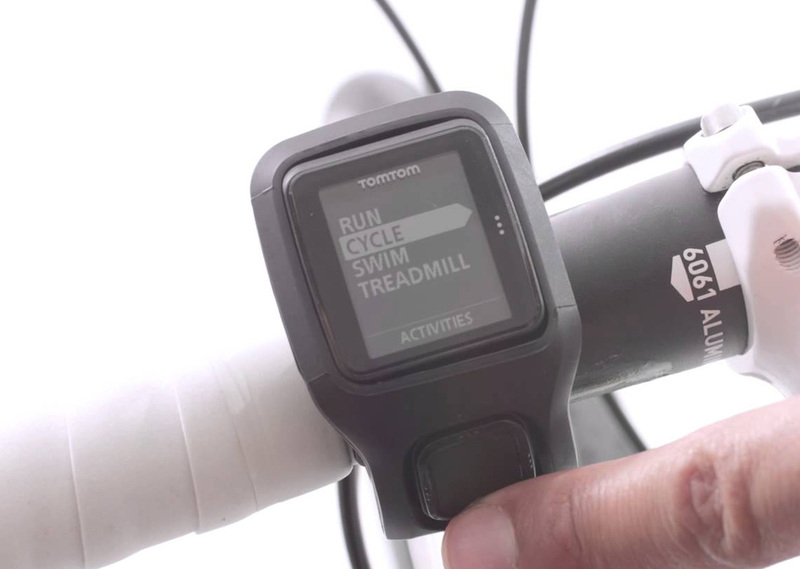 The TomTom HR monitor connects to it as well – assuming you have a Bluetooth Smart enable phone. The list of these is not very long though at present and only includes the HTC One and Samsung S3 / S4. 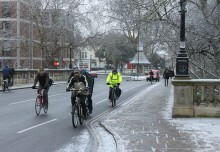 Outdoor cycling is of course much better. It only takes a few seconds for the watch to get a GPS fix and connection to the other sensors is quick too. 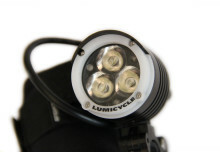 I prefer to leave the device on the watch strap, although you can pop it out and mount it on your handlebars (not stem) using the free rubber mount. Personally I don’t trust it as it’s all a bit flimsy and would probably only use a stem-mount anyway as I like by bars clutter-free. GPS accuracy is very good, no dodgy deviations and the signal remains strong even when passing under thick foliage. My biggest gripe though is the lack of auto-pause. Sure, Strava will recalculate your moving time based on the raw data but it’s something most cyclists expect. 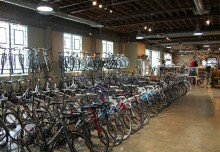 For those of you who don’t just cycle this is where the value of the TomTom comes in. 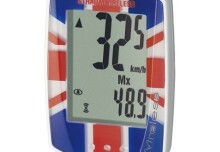 You can pick up a dedicated bike GPS for less than £100 but proper multisport units normally cost quite a bit more, especially if you want HR readings. I didn’t cover all of the different setting; goals, intervals, laps, zones, race, HR zones, and instead mainly just used for outdoor and treadmill running. Outdoors was fine, the satellites came up really quick, although the HR strap was sometimes flaky (not seen on cycle mode), and the instant pace feature was really just an average of the last 30 seconds. The display was big enough to be seen at a glance and the different menu options were easy to scroll through. Treadmill running was a bit rubbish though. It works OK if you run at a constant, steady pace and are happy to calibrate after each run but if you do intervals it just isn’t accurate enough. It’s hardly surprising though as it’s only using the built in accelerometers plus information about your age and height to guess at speed. It’s worth noting that other similar watches also struggle. I really like the swim mode as I’m always drifting off into a world of my own when doing long sessions and it’s great that something is keeping track of my lengths. I hardly ever experienced missed or over-read laps and this was normally when I had a quick change in pace or stroke mid-length. Again, I didn’t use the more detailed functions and would struggle to see how useful they would be whilst swimming – I’m normally concentrating on not drowning. Outdoor, open-water swims are not covered but you can just go for a ‘run’ and put the sensor in your swim hat where it should get a pretty good signal. That depends on your stroke though. This was about the only device that ticked all of the boxes and came in at a reasonable price and it was the last point that really won me over. Having said that I’m actually quite disappointed with the way Runkeeper handles the data. Pace and HR information from treadmill runs doesn’t show up at all and the swim metrics are quite poor. Strava is much better at handling the data and auto-upload support was added in the spring. I still need to log on to register equipment and add a custom name but it works so well it’s my go-to sports performance site now. 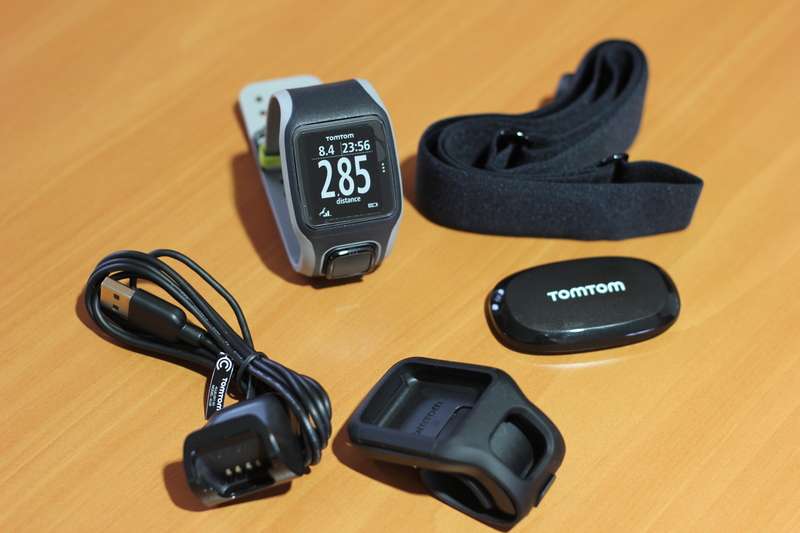 A short word on the TomTom MySports website – Rubbish. Woefully poor, dysfunctional and a waste of time. Just use your own prefers site and simply upload the .fit or .gpx files yourself. It’s clear that the device has niggles, and if you head on over to the support forum you will see that a few people aren’t happy about some of the features that didn’t cause me problems. To be fair to TomTom they are listening and they have added loads of new features in the last six months together with an iOS app to allow upload to their website via your phone rather than having to use a PC. As you can see on the development timeline an Android version is coming in September along with a few other improvements so they are listening. TomTom are new to the market here and don’t have the experience of Garmin or Polar, but they also don’t have the baggage. Both of those big competitors really try to hold onto your data and it’s refreshing to see a new player letting you export YOUR data to YOUR sites. It’s difficult to see any other watch currently out there that gives you so much functionality for the price; even devices costing almost twice as much still miss something. Unless you want to invest into several different devices then this is probably your best option.